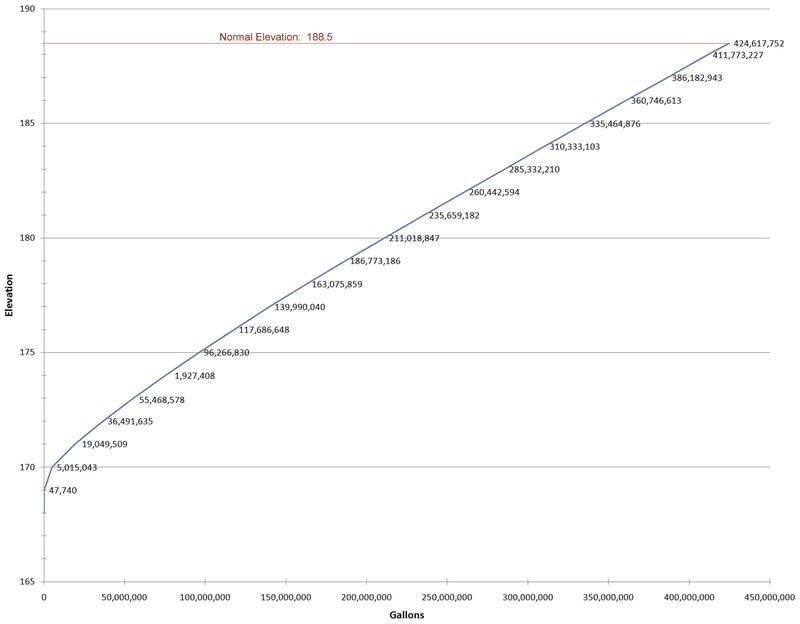 Capacity Curve shows the relationship between water volume and elevation. 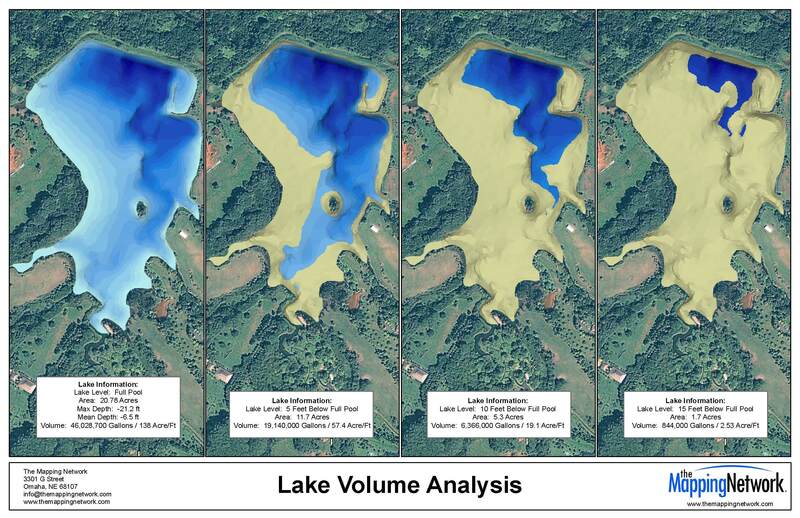 Better understand the volume of your lake with The Mapping Network. This entry was posted in Lake Map and tagged California Bathymetry, California GIS Map, capacity curve, Dredging, Fishing, Florida Bathymetry, GPS Map, Invasive Plants Bathymetry, lake, lake capacity curves, Lake Management, Lake Map, Lake Mapping, Lake Survey, Nebraska Land For Sale, New York Bathymetry, Pennsylvania Bathymetry, Pond Medics, property or hunting area, Texas Dredging on August 9, 2011 by Moderator. Capacity Curve shows the relationship between water volume and elevation. 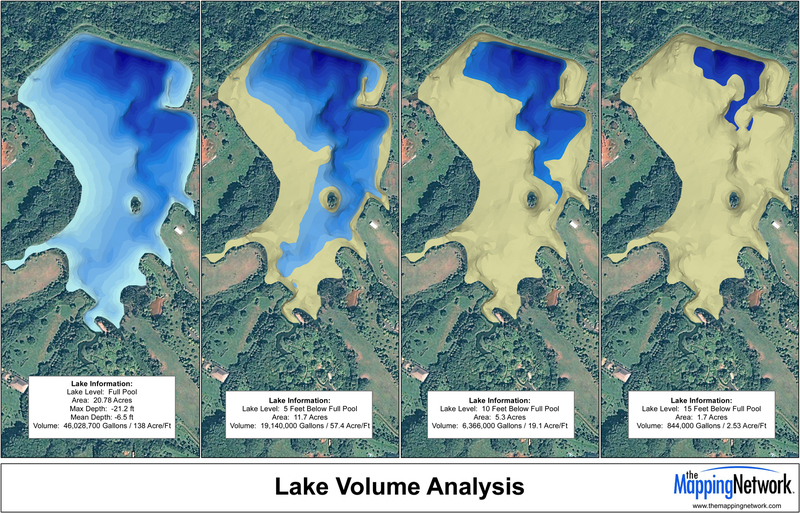 Better understand the volume of your lake with The Mapping Network. This entry was posted in Lake Map and tagged California Bathymetry, California GIS Map, capacity curve, Dredging, Fishing, Florida Bathymetry, GPS Map, Invasive Plants Bathymetry, lake, lake capacity curves, Lake Management, Lake Map, Lake Mapping, Lake Survey, Nebraska Land For Sale, New York Bathymetry, Pennsylvania Bathymetry, Pond Medics, property or hunting area, Texas Dredging on June 17, 2011 by Moderator. This entry was posted in Lake Map and tagged arkansas lake map, Bathymetric Map, Bathymetry, California Bathymetry, California GIS Map, Dredging, dredging a lake, dredging a pond, dreging, Fishing, Florida Bathymetry, GPS, GPS Lake, GPS Map, Invasive Plants Bathymetry, lake, lake dredge, Lake Management, Lake Map, Lake Mapping, lake sediment, Lake Survey, Nebraska Land For Sale, New York Bathymetry, Pennsylvania Bathymetry, Pond Medics, Sediment, sediment map, sediment problems, sediment removal, Sedimentation, Solitude Lake Management, Survey, Texas Dredging, The Mapping Network, Virgina Lake Management on February 8, 2011 by Moderator. It is critical to know the exact acreage and depth range of your lake to make sound management decisions in the battle against invasive aquatic vegetation. Understanding exactly where to apply treatment not only saves time and money but more importantly provides a better opportunity to control aggressive, non-native aquatic plant life. 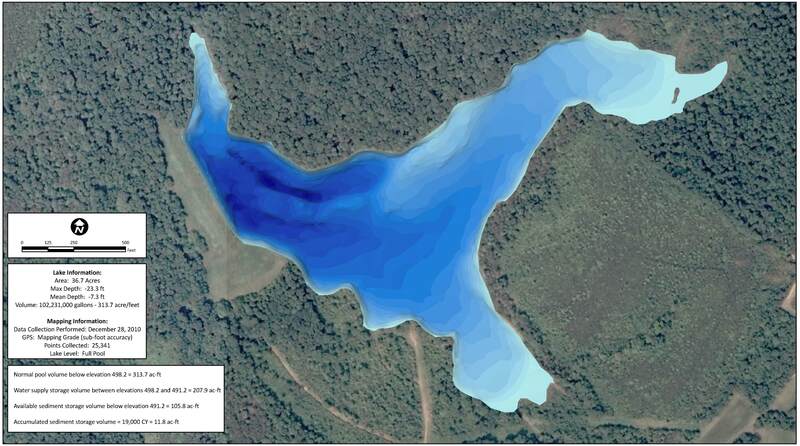 Precision GPS lake mapping conducted by The Mapping Network utilizes highly accurate procedures and equipment for data collection. Utilizing sub-foot accurate GPS units and hydro-acoustic depth-sounding equipment, our team logs data points for extremely accurate location mapping. Hydro-acoustic depth sounding equipment measures depth with unparalleled accuracy. Our clients are able to accurately isolate zones where invasive vegetation is likely to occur or is currently growing. Proper management decisions provided by local lake management professionals will assist in controlling or elevation unwanted aquatic vegetation. 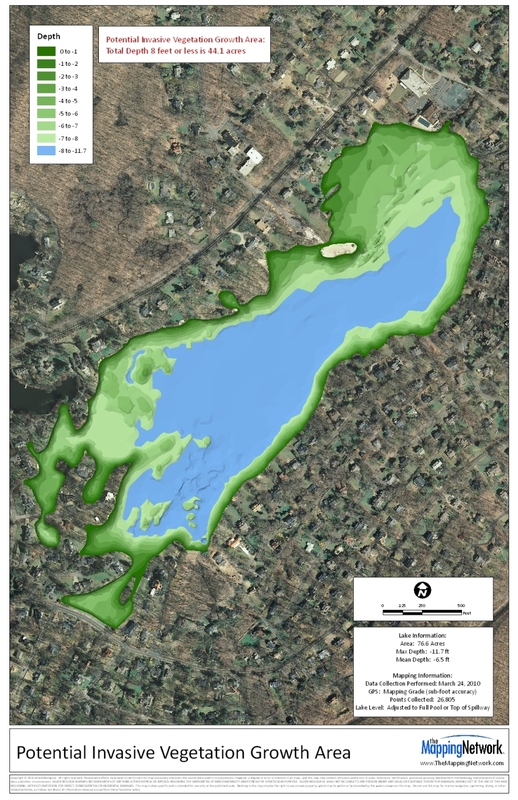 A GPS Bathymetric Lake Map and Depth Isolation Survey by The Mapping Network will help optimize your efforts to control invasive aquatic vegetation in your lake or pond. Please contact us for more information on how this service can assist you in managing your aquatic resource. This map highlights depths up to 8 feet where invasive aquatic vegetation can grow. This entry was posted in Lake Map and tagged Bathymetric Map, California Bathymetry, California GIS Map, Dredging, Fishing, Florida Bathymetry, GPS Map, Invasive Plants Bathymetry, lake, Lake Management, Lake Map, Lake Mapping, Lake Survey, Nebraska Land For Sale, New York Bathymetry, Pennsylvania Bathymetry, Pond Medics, Texas Dredging on February 2, 2011 by Moderator.